Background: There is no single echo parameter correlates with LVSHF symptoms; however, TDI is a promising tool for assessing both systolic and diastolic heart failure. Methods: 50 patients with symptomatic LVSHF (EF ≤ 40% by echocardiography) patients assessed for Functional severity of heart failure according to NYHA classification, Specific activity scale (SAS) test of Goldman, Six minutes walking test, Conventional echocardiographic examination, and TDI for the mitral annulus. The correlation between variables was done using correlation coefficient (r) between heart failure symptoms severity as assessed by NYHA function class (NYHAFC), specific activity scale function Class (SASFC), 6 minutes walking test (6MWT) and echo-tissue Doppler parameters. Results: There was no significant correlation between 6 minutes walking test and both echo or TDI parameters. There was a significant negative correlation between systolic mitral annular velocity (Sm wave) and both NYHA function class and specific activity scale function class. However, there was no significant correlation with six minutes walking test, and when the study subjects were divided into ICM group and DCM group this correlations persist in the DCM group and lost in the ICM group. There was no significant correlation between systolic heart failure symptoms severity and both Early and late diastolic mitral annular velocities. Conclusion: Systolic mitral annular motion by TDI (Sm wave) are useful noninvasive method for evaluation of the systolic LV function and correlates well with both NYHAFC and SASFC however, this correlation is significant for dilated non ischemic cardiomyopathy. HF is a complex clinical syndrome that results from any structural or functional impairment of ventricular filling or ejection of blood. The cardinal manifestations of HF are dyspnea and fatigue, which may limit exercise tolerance, and fluid retention, which may lead to pulmonary and/or splanchnic congestion and/or peripheral edema. Data on the incidence of heart failure have consistently demonstrates that heart failure is a common problem, and one that increases markedly with advancing age. The prevalence of heart failure is also increasing as the population ages and the proportion of the population over the age of 65 increases. Ischemic heart disease is currently the most common etiology of chronic heart failure (CHF) in the United States. Primary valvular disease accounts for 7% of cardiac failure cases, and the majority involves disease of the left-sided cardiac valves. Primary disease of the cardiac muscle can present in a number of forms, three basic forms of functional impairment that have been described (DCM), (HCM) & (RCM) . There are two types of heart failure patient’s exercise performance methods: subjective and objective. The subjective methods include NYHA classification, various activity scales, and quality of life specific questionnaires. The objective methods include various modes of exercise testing to document submaximal exercise capacity (6-minute corridor walk test and anaerobic threshold analysis), as well as maximal exercise capacity (exercise time and maximal oxygen consumption measurement) . A variety of noninvasive imaging modalities are available for assessment of patients with heart failure. These include echocardiography, TDI, radionuclide imaging, and cardiovascular magnetic resonance imaging (CMRI), without any correlation to symptoms severity of left ventricular systolic heart failure. Therefore, in this study we correlated the clinical severity of symptoms of left ventricular systolic heart failure with Echo-Tissue Doppler Indices of the left ventricular function. Conventional echocardiographic examination: Echocardiography was performed with the patients in the left lateral decubitus position. Measurements had been performed according to the recommendations of the American Society of Echocardiography, using Philips EnVisor CHD equipped with 2.5-3 MHZ adult probe. M-mode tracing: It was obtained to determined (LV) internal dimensions and the percentage of fractional shortening (FS %) as well as LVEF. Two-dimensional imaging examination was performed in the standard fashion in parasternal long- and short-axis views and apical 4- and 2-chamber views, and TDI for the mitral annulus. DTI Examination: DTI of the mitral annulus was obtained from the apical (2- and 4-chamber). The sample volume was placed sequentially at the septal and lateral mitral annuli and the resulting velocities were recorded, taking the average of three consecutive beats during normal respiration as follows: peak systolic velocity (Sm), early (Em) and late (Am) diastolic velocities. Statistical analysis: It was done using SPSS version 17 data expressed as mean ± standard deviation correlation between variables was done using the Pearson correlation and spearman’s rho for nonparametric correlations, significance was considered at P value <0.05. The correlation between variables was done using correlation coefficient (r); a positive r value denotes +Ve correlation while a negative r value denotes negative correlation respectively. A correlation (+ve or –Ve) was considered significant at a P value of <0.05. 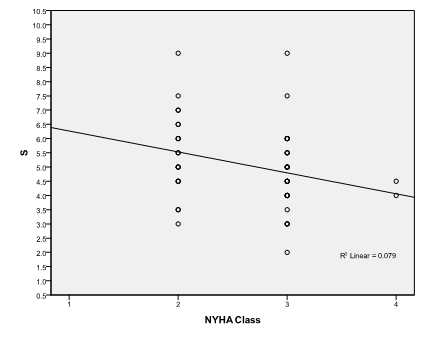 There was a highly significant positive correlation between NYHA function class and SASFC (r= 0.726) [P< 0.001] and there was a highly significant negative correlation between 6MWT and both NYHA function class (r= -0.501) [P<0.001] and SASFC (r= -0.411) [P=0.003]. Table 1 demonstrates Patient’s demographic data and characteristics, and Table 2 shows Echo and TDI patients’ characteristics. Table 1: Patient’s demographic data and characteristics. Table 2: Echo and TDI patients’ characteristics. 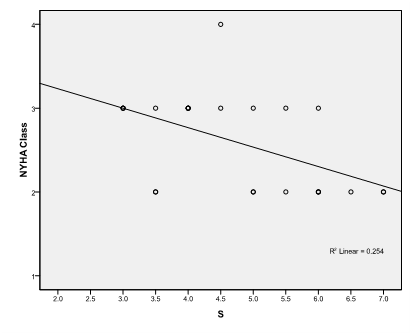 There was no significant correlation between NYHA classification and 2D-echo parameters as ejection fraction (r=-0.186), LVEDD (r=-0.002), LVESD (r=0.047). As regard TDI There was a significant negative correlation between NYHA classification and Systolic annular motion (S wave) (r=-0.312) [P=0.027] as shown in Figure 1, however, there was no significant correlation between NYHA classification and early diastolic velocity (E' wave) (r= -0.260) as well as late diastolic velocity (A' wave) (r=-0.094). Figure 1: There is a significant negative correlation between NYHA classification and Sm wave in TDI [p=0.027]. There was no significant correlation between SASFC and 2D-echo parameters as ejection fraction (r=-0.102), LVEDD (r=-0.124), LVESD (r=-0.093), As regard TDI there was a significant negative correlation between SASFC and S wave velocity (r=-0.301) [p=0.033] as shown in Figure 2, however, there was no significant correlation between SASFC and E' wave velocity (r=-0.144), as well as A' wave velocity (r=-0.080). Figure 2: There is a significant negative correlation between Specific Activity Scale function Class and Sm wave in TDI [P=0.033]. Six minutes walking test correlations: There was no significant correlation between Six minutes walking test and 2D-echo parameters as EF (r=0.162), LVEDD (r = 0.008), LVESD (r=0.001). As regard TDI there was no significant correlation between six minutes walking test and TDI parameters as S wave velocity (r=0.053), E' wave velocity (r=0.191), as well as A' wave velocity (r=-0.216). To test whether ischemic etiology would affect the results correlation, based on history of IHD, previous PCI, previous CABG and/or ECG evidence of ischemia patients were subdivided into ICM and DCM groups, 26 patients were ischemic cardiomyopathy while 24 patients were dilated non ischemic cardiomyopathy. ICM group: In the ICM group patients were all men. Their age ranged from 26 years to 62 years with a mean of 49±10 years. There was 12 patients (46.2%) diabetics, 9 patients (34.6%) hypertensive, 21 patients (80.8%) smokers, and 18 patients (69.2%) dyslipedemic. 8 patients (30.8%) had previous PCI and 5 patients (19.2%) had previous CABG. NYHA classification correlations: There was no significant correlation between NYHA classification and 2D- echo parameters as EF (r=-0.213), LVEDD (r= 0.151), as well as LVESD (r=0.125). As regard TDI there was no significant correlation between NYHA classification and TDI parameters as S wave velocity(r=-0.141), E' wave velocity (r=-0.198), as well as A' wave velocity (r=-0.094). 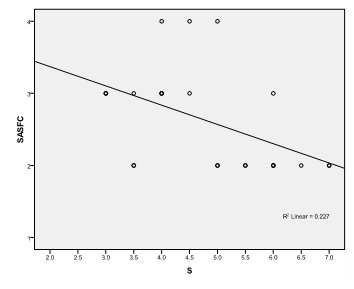 Specific activity scale function class (SASFC) correlations: There was no significant correlation between SASFC and 2D echo parameters as EF (r=-0.019), LVEDD (r=0.117), LVESD (r=0.015). As regard TDI there was no significant correlation between SASFC and TDI parameters as S wave velocity (r=-0.221), E' wave velocity (r=-0.102), as well as A' wave velocity (r=0.059). Six minutes walking test correlations: There was no significant correlation between Six minutes walking test and 2D-echo parameters as ejection fraction (r=0.129), LVEDD (r=-0.047), LVESD (r=-0.047). As regard TDI there was no significant correlation between six minutes walking test and TDI parameters as S wave velocity (r=-0.097), E' wave velocity (r= 0.018), as well as A' wave velocity (r=-0.255). DCM group: In the DCM group there were 6 females and 18 males, with their age ranged from 22 years to 55 years with a mean of 39±11 years, there was 3 patients (12.5%) diabetics, 3 patients (12.5%) hypertensive, 2 patients (8.3%) smokers, their EF ranged from 17% to 38% with a mean of 28±6%. NYHA classification correlations: There was no significant correlation between NYHA classification and 2D-echo parameters as EF (r=-0.216), LVEDD (r=-0.127), as well as LVESD (r=-0.031). As regard TDI There was a highly significant negative correlation between NYHA classification and S wave velocity (r=-0.514) [P=0.010] as shown in Figure 3, however, there was no significant correlation between NYHA classification and E' wave velocity (r=-0.345) as well as A' wave velocity (r=-0.165). Figure 3: There is strong negative correlation between NYHA classification and Sm wave velocity in DCM group [P=0.010]. 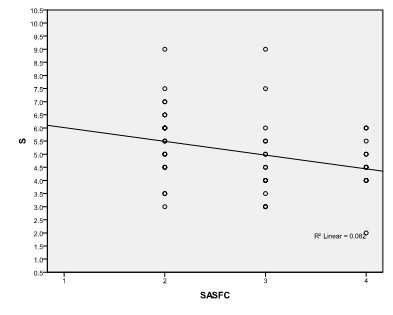 Specific activity scale function class (SASFC) correlations: There was no significant correlation between SASFC and 2D echo parameters as EF (r=-0.313), LVEDD (r=0.385), LVESD (r=0.213). However, there was a significant negative correlation between SASFC and S wave velocity (r=-0.513) [P=0.010] as shown in Figure 4, however, there was no significant correlation between SASFC and E' wave velocity (r=-0.269), as well as A' wave velocity (r=-0.333). Six minutes walking test correlations: There was no significant correlation between Six minutes walking test and 2D-echo parameters as EF (r=0.213), LVEDD (r=0.094), LVESD (r=0.077). As regard TDI there was no significant correlation between six minutes walking test and TDI parameters as S wave velocity (r=0.323), E' wave velocity (r=0.391), as well as A' wave velocity (r=-0.158). Figure 4: There is a significant negative correlation between specific activity scale and Sm wave velocity in DCM group [P=0.010]. LV ejection fraction has been recognized as the most frequent and friendly index to assess cardiac function in both clinical and experimental studies, being relatively easy to measure and to understand, the LV ejection fraction has maintained its position as the most commonly used index. However, it is load dependent and accurate calculation requires measurement of LV end-diastolic and end- systolic volumes; by either echocardiography or LV angiography . In our study there was no significant correlation between heart failure symptoms severity as assessed by NYHA function class, specific activity scale, 6 minutes walking test and echo parameters of LV ejection e.g. LVEF, LVEDD, LVESD even though when the study subjects were subdivided into ICM group and DCM group still there was no significant correlation between NYHA classification and echo parameters in both groups. The results of this study were in agreement with Cohen et al. & Smart et al. which showed that EF and LV dimensions did not correlate with HF symptoms, exercise capacity, or myocardial oxygen consumption. In our study there was a highly significant positive correlation between NYHA function class and SASFC [P< 0.001] and there was a highly significant negative correlation between 6MWT and both NYHA function class [P<0.001] and SASFC [P=0.003] and this results was concordant with  who showed a similar results correlating Six minute walk test distance with both NYHA and SASFC in 41 heart failure clinic patients, which reflects similarity of the different methods used for the functional assessment of symptoms severity in patients with systolic HF and systolic LV dysfunction. In our study the Specific Activity Scale (SAS) questions were modified to suite the Egyptian environment e.g. elimination of some questions regarding activities like skiing and playing golf. And when translated from English to Arabic SAS added more power to communication between physician and heart failure patients. Cokkinos et al. used this questionnaire in 74 patients with heart failure in order to assess validity in patients after cardiac transplantation. The questionnaires were found to be valid and reproducible when translated to French. Their findings and ours should encourage more widespread use of these questionnaires as a more valid method for evaluation of the functional state of heart failure patients. To our knowledge there are no previous studies correlated specific activity scale to echo parameters, however, many studies significantly correlated specific activity scale to other forms of quality of life questionnaire for example living with Heart Failure Questionnaire (MLHF). In our study six minutes walking test correlated poorly with both echo and TDI parameters and this confirmed by a study by Alahdab et al. on 200 patients with heart failure and found that there was no correlation between 6MWT distance walked and LVEF . Several studies have established a good correlation between the 6MWD and the New York Heart Association (NYHA) functional class, LVEF and health-related quality of life score measured by the Minnesota Living with Heart Failure (MLHF) questionnaire to evaluate the severity of CHF. Our study demonstrated that there was a significant negative correlation between systolic mitral annular velocity (Sm wave) and both NYHA function class [P=0.027] and specific activity scale function class [p=0.033] however, there was no significant correlation with six minutes walking test, and when the study subjects were subsequently divided into ICM group and DCM group this correlations persist in the DCM group [P=0.010] and lost in the ICM group. Suggesting an effect of segmental LV dyskinesia on values of Sm wave velocity measured by TDI for the movement of the mitral annulus, and to our knowledge there were no previous studies demonstrating this correlation. On the other hand Vinereanu et al. showed that in patients with heart failure, the longitudinal peak systolic velocity correlated better with BNP levels than other standard echocardiographic measurements including LVEF and mitral inflow patterns. In our study there was no significant correlation between systolic heart failure symptoms severity and both Early and late diastolic mitral annular velocities denoting non association between early and late LV filling and symptoms severity in patients with HF and systolic LV dysfunction. However, in earlier studies Rihal et al. and Troughton et al. showed significant correlation between LV filling dynamics of the LV and cardiac mortality on follow-up of patients with systolic HF. On the other hand, Wang et al. found that the early diastolic mitral annular velocity was reduced from an early stage of reduced LV systolic function and remained reduced even with increased filling pressure which has an incremental prognostic power over what LVEF can provide, with a worse prognosis on long term follow-up [12-16]. In spite of their difference in methodology for evaluation of severity of the degree of HF in patients with LV systolic dysfunction (from totally subjective e.g. NYHA & SAS to totally objective e.g. 6MWT), all are strongly correlated with each other and can be used interchangeably as accurate assessment of severity of HF [17-20]. The Arabic translation of the Specific Activity Scale was shown to be very helpful in both proper evaluation of symptoms severity of HF and improving patient physician relationship in this group of patients. Systolic mitral annular motion by TDI (Sm wave) are useful non invasive method for evaluation of the systolic LV function and correlates well with both NYHA function class and specific activity scale function class however, this correlation is significant for dilated non ischemic cardiomyopathy [21,22]. Our study has few limitations, first, the study population was relatively small and additional future studies with larger patients’ population would be needed. Second, in subdividing systolic heart failure patients into ICM and DCM, although, we were dependant on history and non invasive tests of myocardial ischemia, no routine coronary angiography was done. Finally, in spite of finding no correlation between HF subjects’ evaluation and LVEF, this parameter was shown in previous studies to have prognostic correlation in patients with HF. We suggest a future study involving larger number of patients with long term follow up to test this hypothesis. Low DA, Vichayanrat E, Iodice V, Mathias CJ (2014) Exercise hemodynamics in Parkinson’s disease and autonomic Dysfunction. Parkinsonism Relat Disord 20(5): 549-553. Schatz IJ, Bannister R, Freeman RL (1996) Consensus statement on the definition of orthostatic hypotension, pure autonomic failure and multiple system atrophy. Clin Auton Res 6(2): 125-126. Mathias CJ, Bannister RB, Cortelli P, Heslop K, Polak JM, et al. (1990) Clinical autonomic and therapeutic observations in two siblings with postural hypotension and sympathetic failure due to an inability to synthesize noradrenaline from dopamine because of a deficiency of dopamine beta hydroxylase. Q J Med 75(278): 617-633. Mathias CJ, Mallipeddi R, Bleasdale-Barr K (1999) Symptoms associated with orthostatic hypotension in pure autonomic failure and multiple system atrophy. J Neurol 246(10): 893-898. Sherrid MV, Gunsbug D, Sharma A (2000) Medical treatment of hypertrophic cardiomyopathy. Curr Cardiol Rep 2(2): 148-153. Krams R, Kofflard MJ, Duncker DJ, Von Birgelen C, Carlier S, et al. (1998) Decreased coronary flow reserve in hypertrophic cardiomyopathy is related to remodeling of the coronary microcirculation. Circulation 97(3): 230-233.